The combination of amoxicillin and clavulanate potassium is used to treat many different infections caused by bacteria, such as sinusitis, pneumonia, ear infections, bronchitis, urinary tract infections, and infections of the skin. Each vial contains 1000mg amoxicillin (as sodium salt) and 200mg clavulanic acid (as potassium salt). Each ml of reconstituted solution contains 50mg amoxicillin (as sodium salt) and 10mg clavulanic acid (as potassium salt). Refer to section 6.6 for the method of reconstitution. Each 1.2g vial of Clavuxan (Co-amoxiclav) contains 1.0mmol of potassium and 3.1 mmol of sodium (approx). 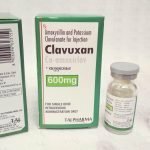 Clavuxan (Co-amoxiclav) 1000mg/200mg Powder for Solution for Injection or Infusion is a white or almost white powder. Skin and soft tissue infections in particular cellulitis, animal bites, severe dental abscess with spreading cellulitis. Consideration should be given to the official guidance on the appropriate use of antibacterial agents. The age, weight and renal function of the patient as shown below. This Clavuxan (Co-amoxiclav) powder for solution for injection or infusion provides a total daily dose of 3000mg amoxicillin and 600mg clavulanic acid when administered as recommended below. If it is considered that a higher daily dose of amoxicillin is required it is recommended that an alternative intravenous formulation of Clavuxan (Co-amoxiclav) is selected in order to avoid administration of unnecessarily high daily doses of clavulanic acid. The duration of therapy should be determined by the response of the patient. Some infections (e.g. osteomyelitis) require longer periods of treatment. Treatment should not be extended beyond 14 days without review (see section 4.4 regarding prolonged therapy). Consideration should be given to local guidelines on appropriate dosing frequencies for amoxicillin/clavulanic acid. For surgical prophylaxis For procedures less than 1 hour in duration, the recommended dose of Clavuxan (Co-amoxiclav) is 1000 mg/200 mg to 2000 mg/200 mg given at induction of anaesthesia (Doses of 2000 mg/200 mg can be achieved by using an alternative intravenous formulation of Clavuxan (Co-amoxiclav)). For procedures greater than 1 hour in duration, the recommended dose of Clavuxan (Co-amoxiclav) is 1000 mg/200 mg to 2000 mg/200 mg given at induction of anaesthesia, with up to 3 doses of 1000 mg/200 mg in 24 hours. Clear clinical signs of infection at operation will require a normal course of intravenous or oral therapy post-operatively. Children aged less than 3 months or weighing less than4 kg: 25 mg/5 mg per kg every 12 hours. No dose adjustment is required in patients with creatinine clearance (CrCl) greater than 30 ml/min. Haemodialysis 25 mg/5 mg per kg given every 24 hours, plus a dose of 12.5 mg/2.5 mg per kg at the end of dialysis (as serum concentrations of both amoxicillin and clavulanic acid are decreased). 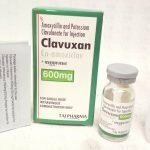 Clavuxan (Co-amoxiclav) is for intravenous use. 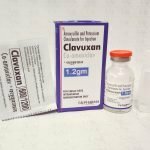 Clavuxan (Co-amoxiclav) may be administered either by slow intravenous injection over a period of 3 to 4 min directly into a vein or via a drip tube or by infusion over 30 to 40 min. Clavuxan (Co-amoxiclav) is not suitable for intramuscular administration. Children aged less than 3 months should be administered Clavuxan (Co-amoxiclav) by infusion only. Treatment with Clavuxan (Co-amoxiclav) may be initiated by the use of an intravenous preparation and completed with an appropriate oral presentation as considered appropriate for the individual patient. For instructions on reconstitution of the product see section 6.6. Hypersensitivity to the active substances, to any of the penicillins or to any of the excipients listed in section 6.1. History of a severe immediate hypersensitivity reaction (e.g. anaphylaxis) to another β-lactam agent (e.g. a cephalosporin, carbapenem or monobactam). History of jaundice/hepatic impairment due to amoxicillin/clavulanic acid (see section 4.8). Before initiating therapy with amoxicillin/clavulanic acid, careful enquiry should be made concerning previous hypersensitivity reactions to penicillins, cephalosporins, or other beta-lactam agents (see section 4.3 and 4.8). Serious and occasionally fatal hypersensitivity reactions (including anaphylactoid and severe cutaneous adverse reactions) have been reported in patients on penicillin therapy. These reactions are more likely to occur in individuals with a history of penicillin hypersensitivity and in atopic individuals. If an allergic reaction occurs, amoxicillin/clavulanic acid therapy should be discontinued and appropriate alternative therapy instituted. In the case that an infection is proven to be due to an amoxicillin-susceptible organisms(s) then consideration should be given to switching from amoxicillin/clavulanic acid to amoxicillin in accordance with official guidance. This presentation of Clavuxan (Co-amoxiclav) may not be suitable for use when there is a high risk that the presumptive pathogens have resistance to beta-lactam agents that is not mediated by beta-lactamases susceptible to inhibition by clavulanic acid. As no specific data for T>MIC are available and the data for comparable oral presentations are borderline, this presentation (without additional amoxicillin) may not be suitable for the treatment of penicillin-resistant S. pneumoniae. Convulsions may occur in patients with impaired renal function or in those receiving high doses (see section 4.8). Amoxicillin/clavulanic acid should be avoided if infectious mononucleosis is suspected since the occurrence of a morbilliform rash has been associated with this condition following the use of amoxicillin. Concomitant use of allopurinol during treatment with amoxicillin can increase the likelihood of allergic skin reactions. The occurrence at the treatment initiation of a feverish generalised erythema associated with pustula may be a symptom of acute generalised exanthemous pustulosis (AGEP) (see Section 4.8). This reaction requires Clavuxan (Co-amoxiclav) discontinuation and contra-indicates any subsequent administration of amoxicillin. Amoxicillin/clavulanic acid should be used with caution in patients with evidence of hepatic impairment (see sections 4.2, 4.3 and 4.8). Antibiotic-associated colitis has been reported with nearly all antibacterial agents including amoxicillin and may range in severity from mild to life threatening (see section 4.8). Therefore, it is important to consider this diagnosis in patients who present with diarrhoea during or subsequent to the administration of any antibiotics. Should antibiotic-associated colitis occur, Clavuxan (Co-amoxiclav) should immediately be discontinued, a physician be consulted and an appropriate therapy initiated. Anti-peristaltic drugs are contra-indicated in this situation. Periodic assessment of organ system functions, including renal, hepatic and haematopoietic function is advisable during prolonged therapy. Prolongation of prothrombin time has been reported rarely in patients receiving amoxicillin/clavulanic acid. Appropriate monitoring should be undertaken when anticoagulants are prescribed concomitantly. Adjustments in the dose of oral anticoagulants may be necessary to maintain the desired level of anticoagulation (see section 4.5 and 4.8). In patients with reduced urine output crystalluria has been observed very rarely, predominantly with parenteral therapy. During administration of high doses of amoxicillin it is advisable to maintain adequate fluid intake and urinary output in order to reduce the possibility of amoxicillin crystalluria. In patients with bladder catheters, a regular check of patency should be maintained (see section 4.9). During treatment with amoxicillin, enzymatic glucose oxidase methods should be used whenever testing for the presence of glucose in urine because false positive results may occur with non-enzymatic methods. The presence of clavulanic acid in Clavuxan (Co-amoxiclav) may cause a non-specific binding of IgG and albumin by red cell membranes leading to a false positive Coombs test. There have been reports of positive test results using the Bio-Rad Laboratories Platelia Aspergillus EIA test in patients receiving amoxicillin/clavulanic acid who were subsequently found to be free of Aspergillus infection. Cross-reactions with non-Aspergillus polysaccharides and polyfuranoses with Bio-Rad Laboratories Platelia Aspergillus EIA test have been reported. Therefore, positive test results in patients receiving amoxicillin/clavulanic acid should be interpreted cautiously and confirmed by other diagnostic methods. This medicinal product contains 3.1 mmol of sodium per vial. To be taken into consideration by patients on a controlled sodium diet. This medicinal product contains 1.0 mmol of potassium per vial. To be taken into consideration by patients with reduced kidney function or patients on a controlled potassium diet. Concomitant use of probenecid is not recommended. Probenecid decreases the renal tubular secretion of amoxicillin. Concomitant use of probenecid may result in increased and prolonged blood levels of amoxicillin but not of clavulanic acid. In patients receiving mycophenolate mofetil, reduction in pre-dose concentration of the active metabolite mycophenolic acid (MPA) of approximately 50% has been reported following commencement of oral amoxicillin plus clavulanic acid. The change in pre-dose level may not accurately represent changes in overall MPA exposure. A change in the dose of mycophenolate mofetil should not normally be necessary in the absence of clinical evidence of graft dysfunction. Close clinical monitoring should be performed during the combination and shortly after antibiotic treatment. Animal studies do not indicate direct or indirect harmful effects with respect to pregnancy, embryonal/foetal development, parturition or postnatal development (see section 5.3). Limited data on the use of amoxicillin/clavulanic acid during pregnancy in humans do not indicate an increased risk of congenital malformations. In a single study in women with preterm, premature rupture of the foetal membrane it was reported that prophylactic treatment with amoxicillin/clavulanic acid may be associated with an increased risk of necrotising enterocolitis in neonates. Use should be avoided during pregnancy, unless considered essential by the physician. Both substances are excreted into breast milk (nothing is known of the effects of clavulanic acid on the breast-fed infant). Consequently, diarrhoea and fungus infection of the mucous membranes are possible in the breast-fed infant, so that breast-feeding might have to be discontinued. Amoxicillin/clavulanic acid should only be used during breast-feeding after benefit/risk assessment by the physician in charge. The most commonly reported adverse drug reactions (ADRs) are diarrhoea, nausea, and vomiting. The ADRs derived from clinical studies and post-marketing surveillance with Clavuxan (Co-amoxiclav), sorted by MedDRA System Organ Class are listed below. 5 A moderate rise in AST and/or ALT has been noted in patients treated with beta-lactam class antibiotics, but the significance of these findings is unknown. 6 These events have been noted with other penicillins and cephalosporins (see section 4.4). 7 If any hypersensitivity dermatitis reaction occurs, treatment should be discontinued (see section 4.4). Gastrointestinal symptoms and disturbance of the fluid and electrolyte balances may be evident. Amoxicillin crystalluria, in some cases leading to renal failure, has been observed (see section 4.4). Convulsions may occur in patients with impaired renal function or in those receiving high doses. Amoxicillin has been reported to precipitate in bladder catheters, predominantly after intravenous administration of large doses. A regular check of patency should be maintained (see section 4.4). Amoxicillin/clavulanic acid can be removed from the circulation by haemodialysis. Pharmacotherapeutic group: Combinations of penicillins, incl. beta-lactamase inhibitors; ATC code: J01CR02. Clavulanic acid is a beta-lactam structurally related to penicillins. It inactivates some beta-lactamase enzymes thereby preventing inactivation of amoxicillin. Clavulanic acid alone does not exert a clinically useful antibacterial effect. Inactivation by those bacterial beta-lactamases that are not themselves inhibited by clavulanic acid, including class B, C and D.
Alteration of PBPs, which reduce the affinity of the antibacterial agent for the target. 1 The reported values are for Amoxicillin concentrations. For susceptibility testing purposes, the concentration of Clavulanic acid is fixed at 2 mg/l. 2 The reported values are Oxacillin concentrations. 3 Breakpoint values in the table are based on Ampicillin breakpoints. 4 The resistant breakpoint of R>8 mg/l ensures that all isolates with resistance mechanisms are reported resistant. 5 Breakpoint values in the table are based on Benzylpenicillin breakpoints. $ Natural intermediate susceptibility in the absence of acquired mechanism of resistance. £ All methicillin-resistant staphylococci are resistant to amoxicillin/clavulanic acid. § All strains with resistance to amoxicillin that is not mediated by beta-lactamases are resistant to amoxicillin/clavulanic acid. 1 This presentation of amoxicillin/clavulanic acid may not be suitable for treatment of Streptococcus pneumoniae that are resistant to penicillin (see sections 4.2 and 4.4). 2 Strains with decreased susceptibility have been reported in some countries in the EU with a frequency higher than 10%. The pharmacokinetic results for studies in which amoxicillin/clavulanic acid was administered to groups of healthy volunteers as either 500 mg/100 mg or 1000 mg/200 mg given as a bolus intravenous injection are presented below. About 25% of total plasma clavulanic acid and 18% of total plasma amoxicillin is bound to protein. The apparent volume of distribution is around 0.3-0.4 l/kg for amoxicillin and around 0.2 l/kg for clavulanic acid. Following intravenous administration, both amoxicillin and clavulanic acid have been found in gall bladder, abdominal tissue, skin, fat, muscle tissues, synovial and peritoneal fluids, bile and pus. Amoxicillin does not adequately distribute into the cerebrospinal fluid. From animal studies there is no evidence for significant tissue retention of drug-derived material for either component. Amoxicillin, like most penicillins, can be detected in breast milk. Trace quantities of clavulanic acid can also be detected in breast milk (see section 4.6). Amoxicillin is partly excreted in the urine as the inactive penicilloic acid in quantities equivalent to up to 10 to 25% of the initial dose. Clavulanic acid is extensively metabolized in man, and eliminated in urine and faeces and as carbon dioxide in expired air. The major route of elimination for amoxicillin is via the kidney, whereas for clavulanic acid it is by both renal and non-renal mechanisms. Amoxicillin/clavulanic acid has a mean elimination half-life of approximately one hour and a mean total clearance of approximately 25 l/h in healthy subjects. Approximately 60 to 70% of the amoxicillin and approximately 40 to 65% of the clavulanic acid are excreted unchanged in urine during the first 6 h after administration of a single 500/100 mg or a single 1000/200 mg bolus intravenous injection. Various studies have found the urinary excretion to be 50-85% for amoxicillin and between 27-60% for clavulanic acid over a 24 hour period. In the case of clavulanic acid, the largest amount of drug is excreted during the first 2 hours after administration. The total serum clearance of amoxicillin/clavulanic acid decreases proportionately with decreasing renal function. The reduction in drug clearance is more pronounced for amoxicillin than for clavulanic acid, as a higher proportion of amoxicillin is excreted via the renal route. Doses in renal impairment must therefore prevent undue accumulation of amoxicillin while maintaining adequate levels of clavulanic acid (see section 4.2). Nonclinical data reveal no special hazard for humans based on studies of safety pharmacology, genotoxicity and toxicity to reproduction. Repeat dose toxicity studies performed in dogs with amoxicillin/clavulanic acid demonstrate gastric irritancy and vomiting, and discoloured tongue. 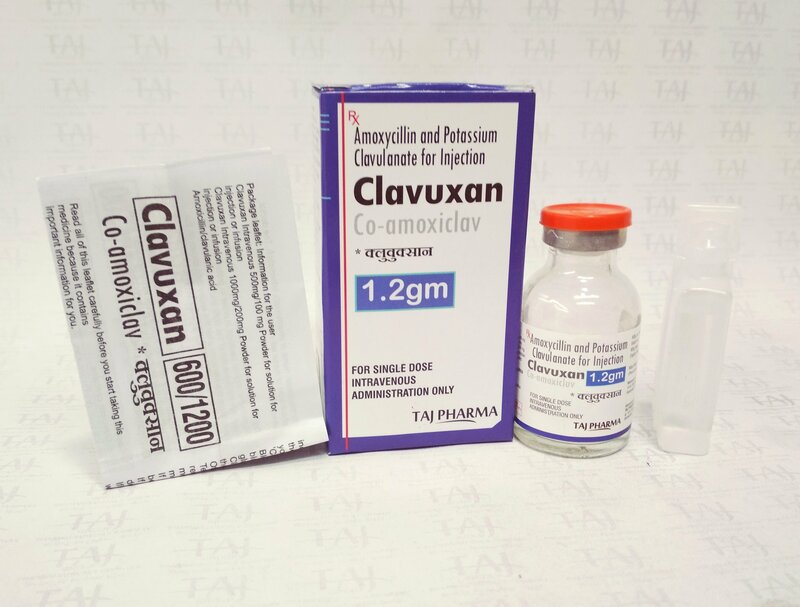 Clavuxan (Co-amoxiclav) Injection should not be mixed with blood products, other proteinaceous fluids such as protein hydrolysates or with intravenous lipid emulsions. Clavuxan (Co-amoxiclav) Injection should not be mixed with infusions containing glucose, dextran or bicarbonate (see section 4.2 for more information). 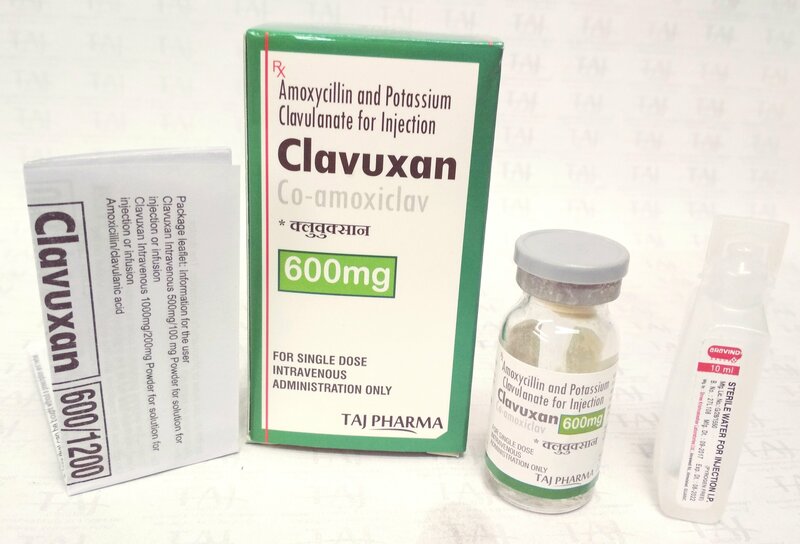 If Clavuxan (Co-amoxiclav) is prescribed concurrently with an aminoglycoside, the antibiotics should not be mixed in the syringe, intravenous fluid container or giving set because loss of activity of the aminoglycoside can occur under these conditions. As packed for sale: 2 years. Use the reconstituted solution immediately. Discard any unused solution. Clear 20ml glass vials (Ph.Eur Type II) with a red chlorobutyl stopper and aluminium-propylene flip-off cap. Water for Injection Ph.Eur. is the normal solvent. Clavuxan (Co-amoxiclav) 1000 mg/200 mg should be dissolved in 20 ml of solvent. This yields approximately 20.9 ml of solution for single-dose use. A transient pink colouration may or may not develop during reconstitution. Reconstituted solutions are normally colourless or a pale straw colour. Clavuxan (Co-amoxiclav) should be administered within 20 min of reconstitution. Clavuxan (Co-amoxiclav) vials are not suitable for multi-dose use. 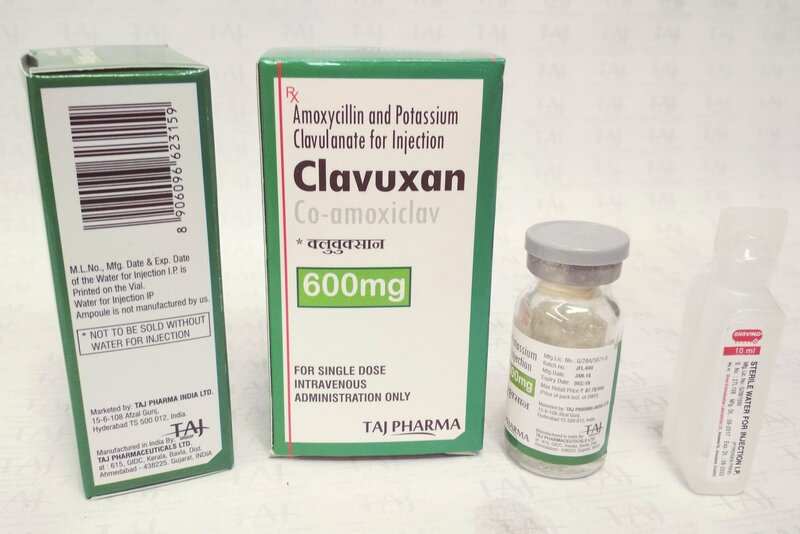 Clavuxan (Co-amoxiclav) should be reconstituted as described above for injection. Without delay the reconstituted solution should be added to 100 ml of infusion fluid using a minibag or in-line burette.